This plant has not been discovered in any early deposits containing seeds. It is distributed at the present time throughout Arctic Europe, North Africa, Siberia, West Asia to the Himalayas, North America, Fuegia, Chili. In Great Britain it is absent from Cornwall, North Devon, N. Somersets, Dorset, I. of Wight, Monmouth, Worcester, from S. Wales; and it occurs in N. Wales only in Carnarvon, Denbigh, Flint, Anglesea; and is absent from S. Lancs, Westmorland, Ayr, Renfrew, Peebles, Selkirk, Mid and N. Perth. In England it is not uncommon, in Scotland it is rarer in the West and N. Highlands. The Field Mouse-ear turns up here and there over a wide area in England upon the stony heights of the Midlands, and on sandy fields and waste places in the south and east. It is a saxicolar xerophyte, and may be found, on walls and rocks, in situations similar to the Cheddar Pink, Sandwort, Bird's-foot, White Meadow Saxifrage, Mouse-ear Hawkweed, Musk Thistle, and other dry-soil-loving species. 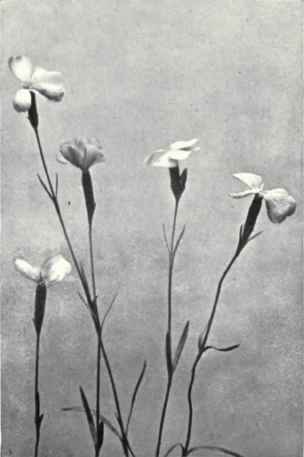 This plant is very rigid, and generally prostrate, with numerous barren shoots which make a kind of turf where they grow, but the flowering shoots are ascending. The leaves are deep-green, linear-lance-shaped, blunt, and fringed with hairs at the base. The stem is brittle owing to jointing. 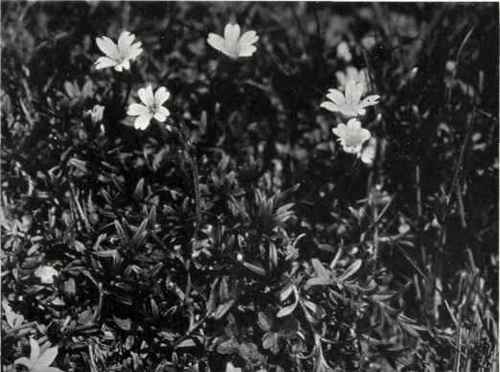 The flowers are larger than in the Common Mouse-ear, the petals being twice as long as the calyx, which has membranous margins and tips. The capsule is longer than the calyx, and the seeds are acutely tubercled, numerous, and reddish-brown. The plant in flower is usually at most 6 in. in height. It flowers from April and May till August. It is perennial, increasing by division. The honey-glands are situated as in the Greater Stitchwort. The stamens and pistil develop in the same manner. A similar opportunity for cross-pollination is presented when insects visit it, and of self-pollination in their absence. The flowers are large and widely open and conspicuous. The insects that visit it are numerous: Diptera, Stratiomyidae, Empidae, Pepidae, Syrphidae Eristalis, Syritta, Platy-cheirus, Syrphus, Melanostoma, Muscidae, Hymenoptera, Apidae, Cole-optera, Staphylinidae, Thysanoptera, Thrips, Lepidoptera, Polyom-matus phloeas. Besides complete flowers there are some with more or less rudimentary stamens. Field Mouse-ear is mainly dispersed by the wind. The seeds (acutely tuberculate) are blown out of the capsule, the plant growing in exposed positions. It is a sand-loving plant growing on a sand soil, but is also lime-loving, and will subsist on a lime soil. A fungus, Melampsora cerastii, lives upon it. It is galled by Cecidomyia cerastii. The beetle Adimonia tanaceti, and the moths, Coleophora chalcogrammella, C. olivacella, (Small Yellow Underwing), Heliodes arbuti, Heliaca tenebrata, feed on it. The second name, arvense, refers to a reputed prevalence for cultivated land. Though found in the eastern counties in cornfields, it is found on dry banks, sand-banks, and on walls, as well as on hilly ground. It is distinguished from all other species by its large flowers, prostrate habit, the deep-green, not light or yellow leaves, its brittle-jointed stem, and its powerful creeping root. Essential Specific Characters: 53. Cerastium arvense, L. - Stem prostrate, wiry, tufted, leaves linear-lanceolate, downy, petals longer than the calyx, white, bracts membranous on the margin and at the tip.